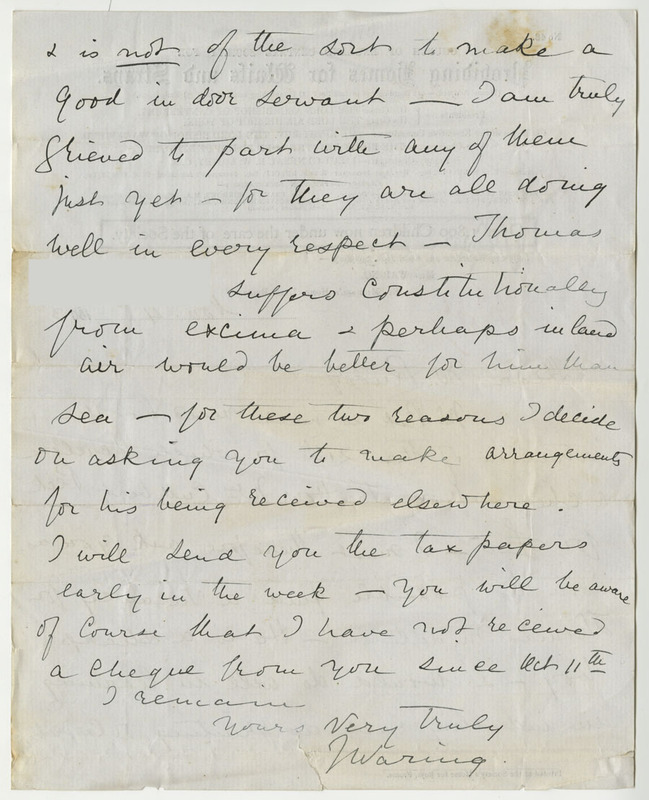 Thomas’ father died from congestion of the lungs in 1891 when Thomas was 7 years old, leaving a widow and four young children. 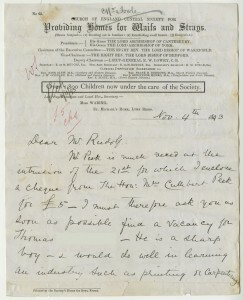 The family lived in Islington in London and the situation must have been hard for Thomas’ mother who was a cleaner, earning 4 shillings per week, which equates to only around £12 per week in today’s money. With an extended family who couldn’t afford to help, the only option for Thomas’ mother was for her to place her children into care so that she would be able to work full-time in domestic service. 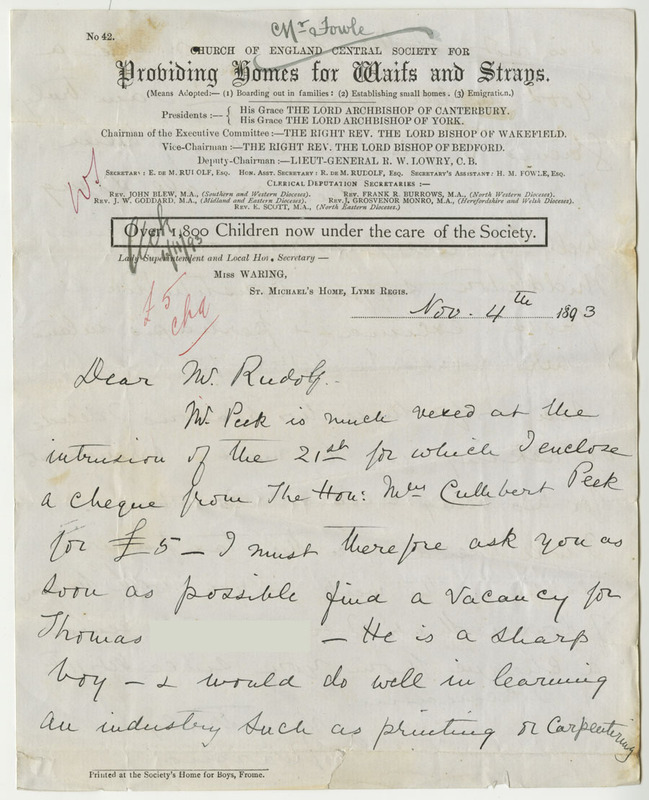 That year, Thomas’ case was accepted by The Children’s Society (then known as the Waifs and Strays Society) and he went to live in the recently-opened St Michael’s Home for Boys in Lyme Regis. A medical form completed when Thomas entered St Michael’s home suggests that Thomas was suffering from a ‘condition’. The exact nature of this condition isn’t stated on the form, although the doctor’s opinion was that it wouldn’t need medical treatment. for his being received elsewhere. a cheque from you since Oct 11th. 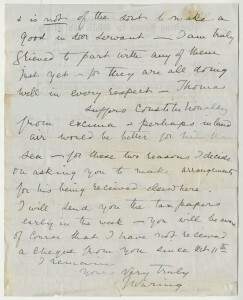 From this letter, we see that Thomas was suffering from eczema. For a reason that is not entirely clear, it appears that one or more boys had to leave the home. In particular, it was thought that living near the coast wasn’t helping Thomas’ condition and that the air found further inland might be better for him. Instead of moving inland, however, we find next that Thomas was moved to another home on the South Coast; this time to Bognor Home for Boys in Sussex. Sadly, no correspondence about this move survives, so we don’t know if this move to another costal home was due to conflicting medical advice or not. 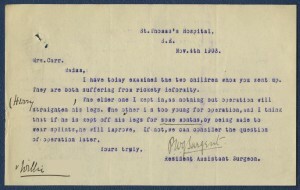 Thomas was still having problems with eczema in 1895 when he would have been 11 years old. In order to help him, he was sent to the Hospital for Skin Diseases at Blackfriars in London. After staying in hospital for two weeks, Thomas was discharged back to the Bognor Home. 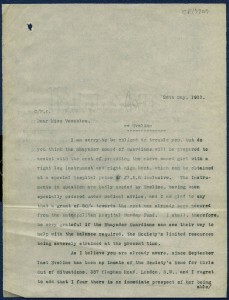 A letter from the hospital states that he was ‘quite cured’. In response, Thomas returned to London to be seen by the doctor who had treated him at the hospital. We don’t know the exact outcome of this visit, but it is possible that the doctor gave Thomas a prescription for more medicine. The next year, when Thomas was 13 years old, he was transferred to the Diocesan Home for Boys in Cambridge, which had recently been taken over by The Society. 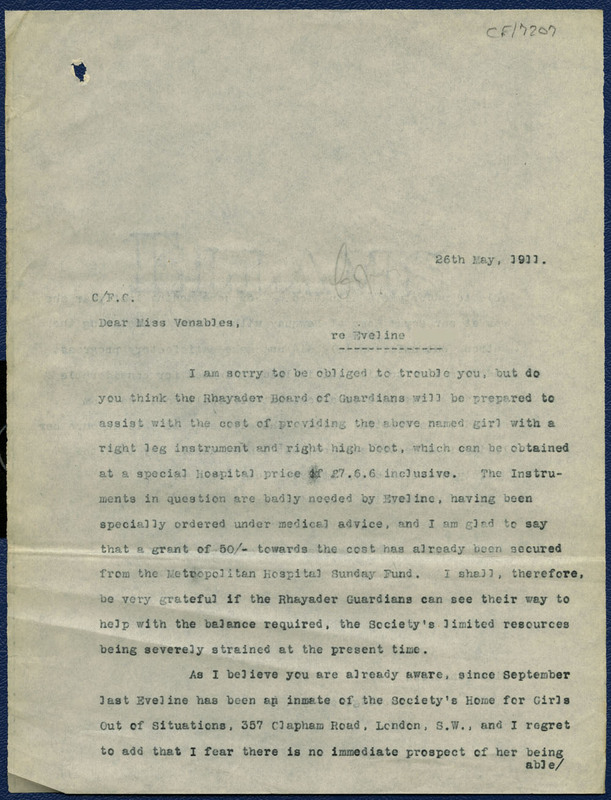 While he was in this home, a letter tells us that he was visiting hospital once a fortnight for treatment for his eczema, which was described as ‘getting better’. Thomas was now of an age where he could begin to learn a trade. It was thought that Thomas would be well-suited to farm work and so in 1897 he was sent to Standon Farm Home for Boys in Staffordshire, which specialised in agricultural teaching. His training appears to have gone well as just over a year later, when Thomas was 15 years old, he went to work for a farmer in Market Drayton in Shropshire. Thomas stayed in this job for one year, then left to go live with his mother who had moved to Huddersfield. Whether he was still continuing his hospital visits at this time, we don’t know. This case, like so many of those that mention medical treatment, is tantalisingly vague. 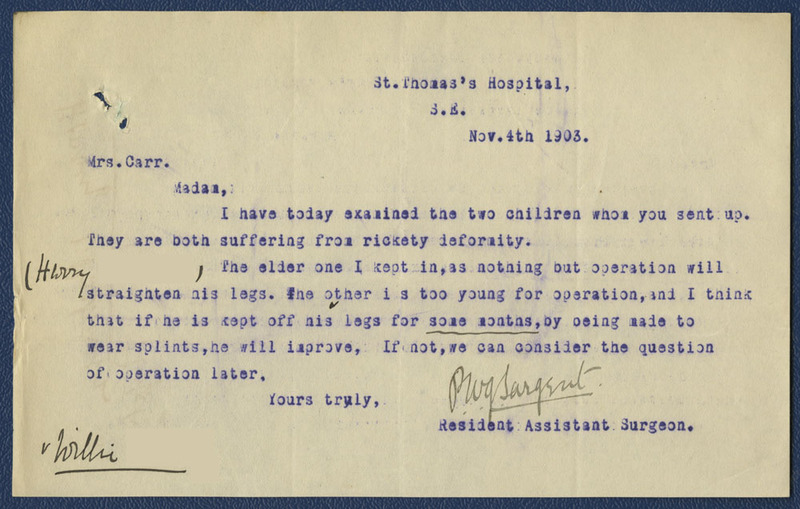 We know that Thomas was visiting hospital and that he had been given lotion and ointment to help with his eczema, but we don’t know exactly what those lotions, ointments and hospital treatments were. Most intriguing for me is the fact that sea air was thought to be bad for eczema. In the late-19th Century so many diseases and conditions were treated with exposure to fresh sea air that it seems strange to find a case where it was recommended that sea air be avoided. If you know why this recommendation might have been made, I’d be really interested to hear your thoughts.